The United VARs Annual Meeting is right around the corner, which is a reason to recap some of the exciting things that happened at last year’s Annual Meeting! Copenhagen, 27 March 2018 – United VARs wants to be celebrating with over 50 members: During 2018, seven member companies joined the world’s largest alliance of SAP solution providers, as well as 3 solution partners, that deliver additional portfolio elements throughout this network of leading technology leaders. How do customers benefit from their IT provider’s position as United VARs member? Clearly by the access to a broad range of SAP solutions, member companies add-ons, partners additional solution portfolio, and new business opportunities globally, delivered by their local service provider in their respective home countries. Recap – What happened last year? 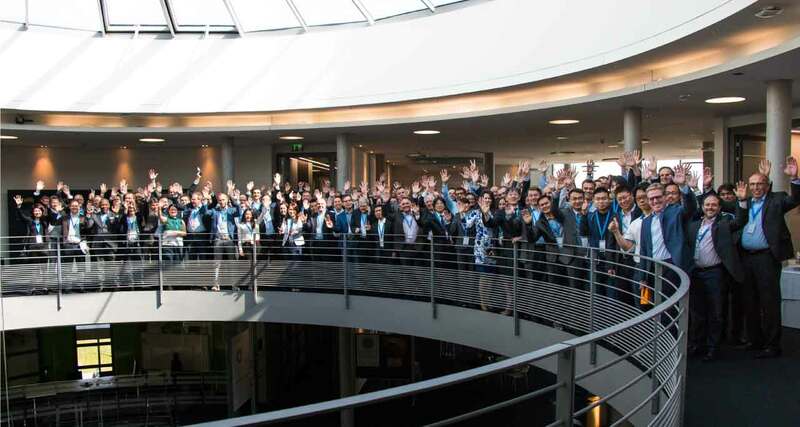 Last year’s United VARs Annual Meeting took place in Waldorf at the SAP headquarters, with over 100 attendees, in April 2018. The newest members were invited to the Annual Meeting were TeamIdea (Russia), with Myanmar Information Technologies (Myanmar), AXXIS Consulting (Singapore), and Soltius (Indonesia). As solution partners, Huawei, Symmetry, NEC, as well as the new partners ProcessWeaver and Isec7 joined the Annual Meeting for the first time and presented their complementary solution portfolio. Additionally, there were nine awards given out to the United VARs members as “Partners of the Year” winners and finalists, with B4B Solutions / Austria for Hybris and Seidor / Spain for Cloud, Analytics & Insight as winners, and United VARs itself as SAP Global Platinum Resellers of the Year. United VARs annual meeting also serves as the perfect foundation for SAP to meet its partners’ most experienced re-sellers from around the world on a single spot; Franck Cohen (President of Digital Core & Industry Solutions), Rodolpho Cardenuto (President of Global Partner Organisation), Bobby Vetter (SVP Global Partner Operations) gave speeches on. The United VARs Annual Meeting 2019 will take place in St.Leon-Rot from the 1st to 4th of April, and will review all of the accomplishments from 2018 and to welcome the new member companies that have recently joined as well as the partners that have successfully joined the alliance in the previous year. As international outsourcing and outreach have become more important to our customers, United VARs is seeking innovative ways to intensify global cooperation and to pass this knowledge on to customers undergoing the globalisation process. With this in mind, at the Annual Meeting it is highlighted how we can add value through increased collaboration of our members, plus offer more services and a joint portfolio for our customers on a global scale – Leading the way. Additionally, the keynote SAP speech will be held by Adaire Fox-Martin who is a member of the Executive Board of SAP SE. As well as speeches will be held by Bobby Vetter, Steffen Burger, Claud Grünewald and many others. Do you want to know more about United VARs?